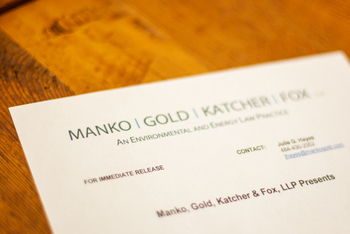 Philadelphia, PA (November 1, 2013) – On November 20, 2013, Manko, Gold, Katcher & Fox partner Jonathan E. Rinde will head to Allentown, Pa. to present “Current Issues in Stormwater Regulation in Pennsylvania”, sponsored by Lorman Education Services. The program will address current legal issues in stormwater, monitoring and inspection, proper design and selection of best management practices (BMPs), and recommendation on how to avoid reactive responses to regulatory changes and plan adequately to ensure compliance. This full-day program runs 8:30 am – 4:30 pm and provides continuing education credits. To learn more about the program and to register, visit www.lorman.com (Course 390314).